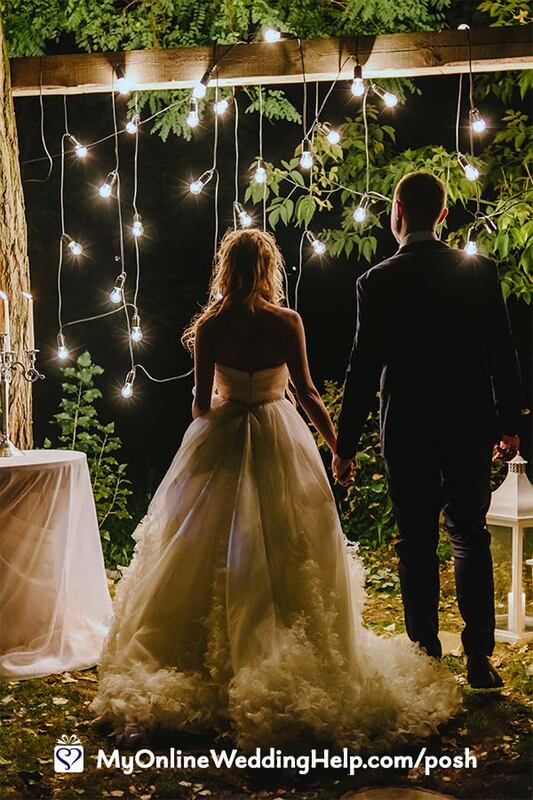 What is a good budget for a wedding? The answer is what you can spend without sacrificing too much elsewhere in your life. As soon as the pain of not having that money overshadows the joy from the nuptials you’ve overspent. Happily, there are ways to have a luxury-looking wedding on a small budget. In general, repetition of common elements is key. This pulls your wedding together into a cohesive look. And gives you ample opportunity to let your uniqueness shine. If you know from the start, you can do this throughout the entire wedding, starting with the save the dates. Or focus on the events only. It’s your choice. To get organized from the start, use our detailed wedding planning checklist. 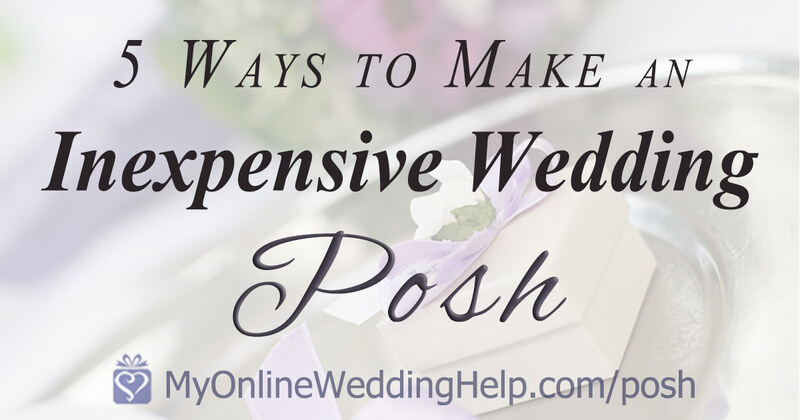 Here are five ideas for doing just that when planning your posh wedding on a budget. Color is the most common way to pull a wedding together. You can take it up a notch by having two contrasting colors. Use the darker for table clothes, backgrounds, and other large expanses; the lighter as an accent color to pop against the other. Extend the cohesion by using one of the colors as your ink color on the printed material. A pattern or monogram can also pull together your wedding look. In addition to the usual placements (invitations, decorations, place settings, and wedding party ensembles), these elements can make an appearance on the aisle runner; incorporated into food, drink, or desserts; or within the lighting. Speaking of lighting, it can make all the difference. Strategically placed colored spotlights can add an upscale look. Vertical light strands hung from trees or rafters can contribute toward a posh ambiance as well. Candlelight is another way to create atmosphere. Tulle is inexpensive and can work wonders when decorating. Drape bunches across the ceiling, secured at the edges and center light, for dramatic elegance. 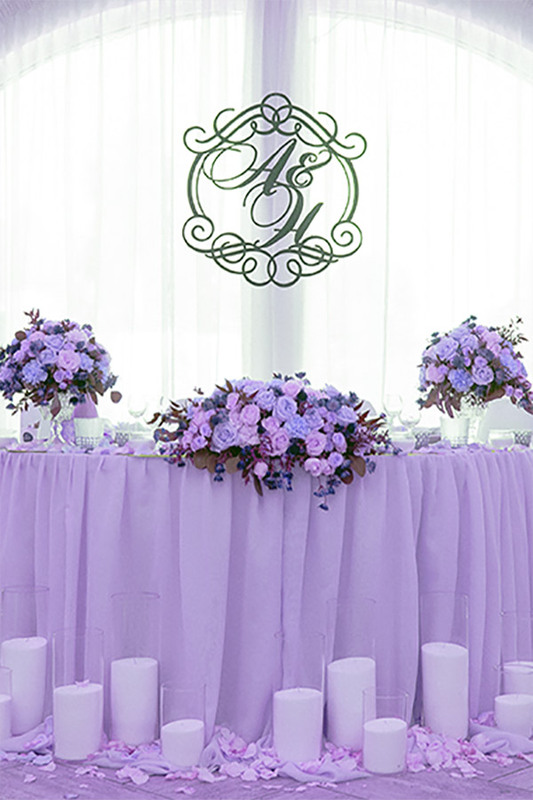 Instead of renting chair covers, drape the material over chair backs and tie with a colorful tulle bow or attach a flower. Tulle table skirts are also attractive. Finishing touches to tablescapes create character. Simply adding a colorful napkin ring or ribbon around a folded napkin, then tucking the menu or a sprig of greenery inside, can add a more upscale look to a table. Even inexpensive napkins, rings made from a roll of ribbon or paper, and home-printed menus look good this way. A runner on top of the tablecloth. Decorative bows around the wine glass stems. Stacked plates–salad atop dinner, for example–also add ambiance. Even with a buffet, you can preset water and drink glasses, silverware, and plates. For more ideas to make a wedding look pleasantly cohesive, see the Wedding Ideas: Making an Inexpensive Wedding Look Upscale Pinboard here. Read on for even more inspiration on how your wedding on a budget can be dreamier than you imagined! Wedding Budget Planner. Free printable with personalized percentages. I had my wedding from dollar stores n home made crafts. I really had a great time. I get lots of ideals fr use wedding catalog’s. Bridal magazines. My neice is getting married. I could have some fun ideas n comment to help her. Thank you all for your comments.